The initial concert of the Delano Chamber Players came about at my bequest and as a result of the need for strings to accompany the Horn Society on one of it's concerts. The string players enjoyed the orchestral experience enough that they requested to continue as an orchestra. I proposed the general format of a chamber orchestra and chamber music series and that was well received by the musicians. Our 1st concert was Sunday, August 3rd, 2008 at 3 in the afternoon and that concert time has been the same since then. The 1st concert consisted of works performed by the Horn Society and myself as the leadoff soloist performing the Concert Rondo in e flat k. 371 for solo horn 2 accompanying horns and strings. The work existed only as a piece for solo horn and piano but it was clear that Mozert intended it to be in a concerto type format with accompanying orchestra. I arranged the music and asked Randy McKee to conduct that piece on the concert. Guy Vollen conducted the Divertimento No. 10 for 2 horns and strings.The subsequent years concerts were made up of a combination of chamber music and chamber orchestra music. 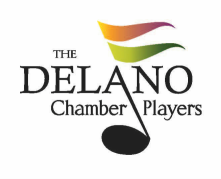 The following season we decided to create The Delano Chamber Players as the parent organization with the Chamber Orchestra, the Chamber Music series and the Delano Chamber Brass as entirely new concept. Our appeal was initially to the musicians as we felt it necessary to achieve a level of performance and literature that would appeal to the musicians primarily and serve a a real reason for them to want to return. We were also offering an experience that could not be had any where in this region. I was initally reluctant to seek large audiences until we achieved a level of performance that would be put us in good stead with the public and with potential reviewers. Bill Johnson was principal conductor for the first season of the Delano Chamber Brass and was named Musical Director for the 2nd and subsequent seasons of the Chamber Brass. Guy Vollen was named Musical Director of all groups for the first season after an initial meeting at my house where the entire orchestra met to hash out the nuts and bolts of just what we were trying to achieve. Guy continued as musical director through the entire second season and asked to be relieved of that resposibility at the end of last season. Thus a search was started with Dr. Wesley DeSpain being named Musical Director for the Chamber Orchestra. It was decided that we would be governed by a board of directors made up of musicians from those participating in all of the groups. The Chamber Orchestra is beginning it's 4th season along with the Chamber Music Series. The Chamber Brass is beginning it's 3rd season. All of our groups have come a long way since the earliest beginnings its the areas of performance, commitment and general overall quality. I believe it is time to reach for an even higher plane of excellence and thus the desire on my part to see an even more professional outlook and presentation both to the musicians and to the public. Our host and largest sponsor is West Side Baptist Church without whom none of these organizations would exist. I initially approached Rev. David Shirer, pastor, through Joel Smith who is a member of the horn society. The relationship has evolved with the Delano Chamber Players now being an outreach ministry of the church. They charge us nothing for use of the property and have turned a great deal of responsibility over to us with a nearly carte banche type of use of the facility.